Since our launch in 2011, ChargeItSpot has been focused on conquering the North American charging kiosk market. We have kiosks rolled out at dozens of national retailers and public venues across 40+ states. In 2018, we were thrilled to expand to round out our North American footprint by expanding to Mexico and hopping oceans and timezones to launch our first units in Australia. ChargeItSpot made an appearance on the FOX Business Network on Mornings with Maria with veteran business journalist Maria Bartiromo. CEO Douglas Baldasare talked about how ChargeItSpot kiosk usage rates are growing 20% year over year and how people who charge their phones in store dwell longer and spend more. 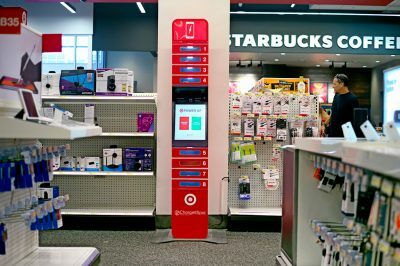 In 2018, ChargeItSpot announced its expansion into nearly 200 Target stores and 50 Banana Republic stores across the US. The expansion – covered by Business Insider – thrilled shoppers who were quick to express their gratitude on social media. 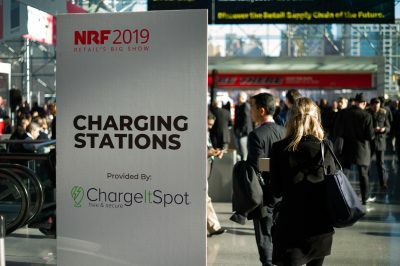 At the beginning of the year, ChargeItSpot was proud to be named the official charging partner of the National Retail Federation’s 2018 conference in NYC. The NRF’s Big Show attracted 36,500 attendees this year who discovered engaging panel discussions on topics like retail technology and company culture. ChargeItSpot will be returning the event in 2019! This November, our CEO Doug Baldasare published a byline in Luxury Daily on how retailers should hook millennial shoppers on Black Friday. The article outlines four tactics retailers should employ to get millennial shoppers in their door: offer in-store pickup (aka BOPIS, Buy Online Pickup In Store), self checkout, a fun in-store experience and practical in-demand amenities and services. As we look to 2019, we will continue to expand our mission to create a nation-wide (and beyond) infrastructure of phone charging kiosks that keep consumers connected and provide retailers with an amenity that boosts customer happiness and their bottom line.